Throughout the week studied, online news consumers reported a total of 13,086 instances with online news – i.e. they got at least some news online within the two-hour window asked about. To get the best sense of how the pathway used to get news and the topic of the news may impact the full news experience, Part II of this report examines the data based on these news instances rather than individuals’ average behavior. Another clear takeaway from this real-time study is that people behave differently depending on the pathway they use to get their news, whether social media, emails, news alerts or direct website visits. For example, news that comes directly through a news organization tends to result in better source recall but, at the same time, is less likely to elicit action afterwards – such as discussing, sharing or commenting. Instead, news that comes through email and texts from friends or family is most likely to prompt follow-up action. While emails and texts from friends or family are a less common way to land upon news than other means, they are most likely to trigger some kind of follow-up action. 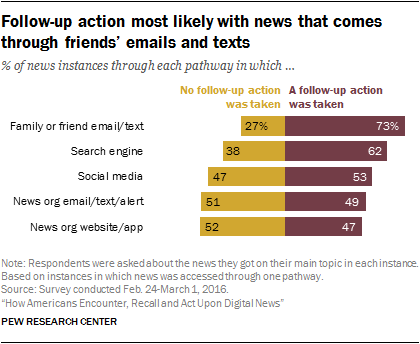 Nearly three-quarters (73%) of the instances in which news came through a friend’s email or text were acted upon in some way, higher than any other pathway. News through search engines was the next highest, which was acted upon in 62% of instances. 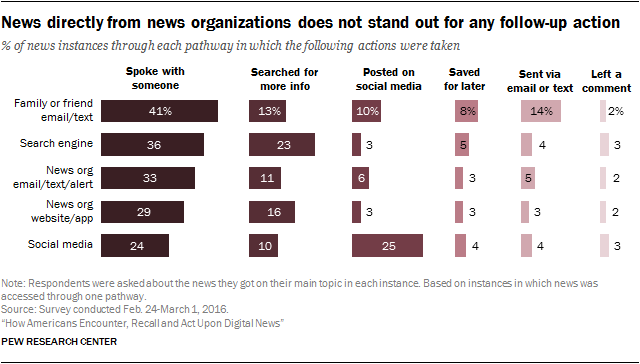 News directly from news organizations does not reach the same level of engagement: Whether through their emails, texts and alerts, or websites and apps, news directly from a news organization was acted upon in about half of instances (49% and 47%, respectively). Perhaps counterintuitively, this was about on par with social media-driven news instances, which led to follow-up actions in 53% of news instances. The specific follow-up actions that stand out for each pathway suggest that social media, search engines and friends’ emails and texts all have success in engaging their consumers within the bounds of their own universes. For example, about a quarter (23%) of the instances in which news came through a search engine led to searching for additional information, a higher share than any other pathway. 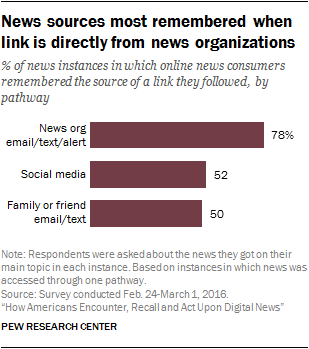 Additionally, 14% of news instances from friends or family led to sending news via email or text, compared with 5% or less of the instances for any other pathway. And while news through social media was one of the least likely to be discussed with someone offline, it was shared on social media itself in a quarter of instances. 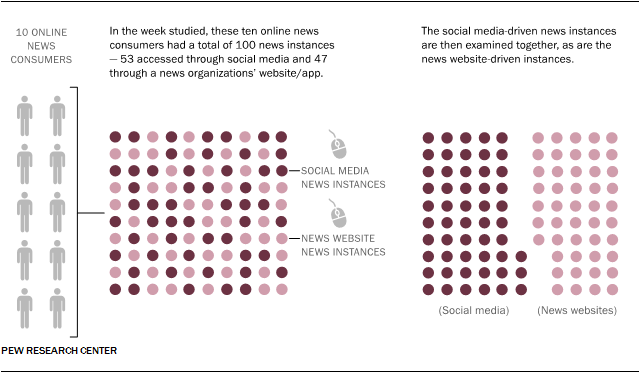 There is no single digital action that stands out for news that comes from a direct connection with a news organization, which could suggest an area of challenge for news organizations in terms of how they connect with and engage audiences. While news directly from news organizations may not encourage a high level of follow-up action, brand awareness of this news is much higher. People’s ability to remember the source of a link within a two-hour window is greater when that link comes directly from a news outlet than when it comes through another pathway. 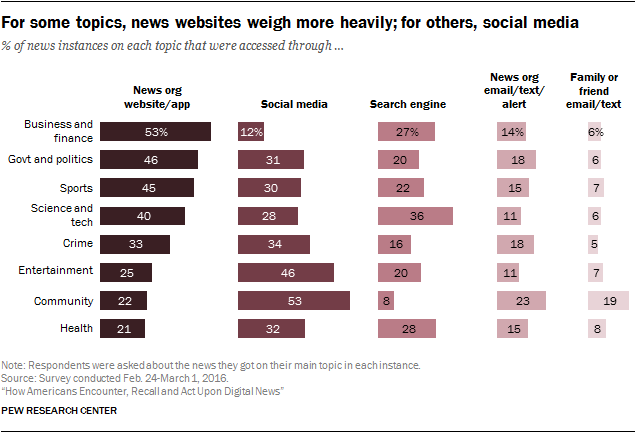 Beyond how news is accessed digitally, the online news experience also varies depending on the topic of news learned about. Community news, for example, is a highly social experience. Compared with many other topics, consumers are more likely to find it through social media or a friend’s email or text and are also more likely to share it with others on social media. Business news, meanwhile, is more likely than any other topic to be intentionally sought out. Additionally, it is one of the topics with the highest source awareness. However, it is one of the least likely to be acted upon. Getting news on certain topics tends to be much more of a deliberate experience than getting news on others. Business news is intentionally sought out more than any other topic. About two-thirds (64%) of news instances about business and finance were deliberately sought out. This was followed by sports (53%) and science news (50%). On the other hand, the topics most likely to be happened upon while doing other things online are community, crime and entertainment news – between 42% and 47% of instances. 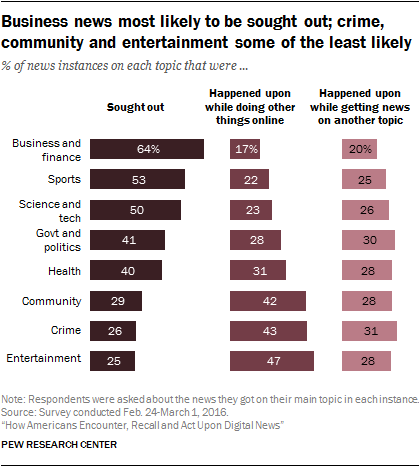 There were few differences across topics in the degree to which people happened upon news while already getting news about something else (business news being the one exception, lower than most other topics). This tendency connects closely to the specific pathways used most often for each news topic. About half of business and finance news (53%), for example, came from a news website or app, about four times the rate at which this news came through social media (12%). Conversely, entertainment (53%) and community news (46%) were both much more likely to be found through social media, versus about a quarter of instances through news organizations’ websites for both topics. For the other pathways, community news again emerges as a social online news experience. In addition to being found on social media at a high rate, community news was at least twice as likely as any other topic to have come from a friend’s email or text – 19% of instances, compared with 8% of instances or less for other topics. Science news, meanwhile, was one of the topics most likely to be found through a search engine (36% of instances). Business news, along with government and politics also carries with it high source awareness. When respondents were asked to name the source of news links followed in the past two hours, they remembered those that linked to business and political news stories about three-quarters of the time (76% and 71%, respectively). This is higher than the share of instances in which the source was remembered for three other topics: entertainment (43%), health (50%) and science news (54%). The sources of news links were remembered between 59% and 67% of the time for crime, sports and community news. 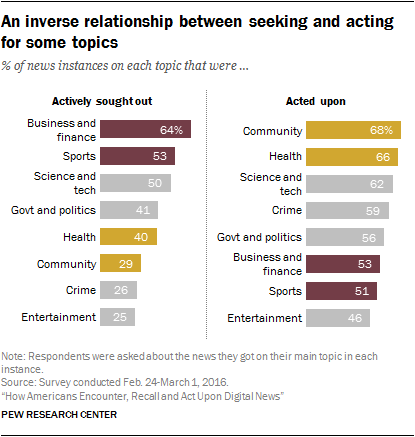 Topics that are more actively sought out are often the least likely to lead to follow-up action, and vice versa.7 For example, while community and health news are not sought out at a high rate compared with the other topics, they are among the topics most likely to be acted upon afterwards. About two-thirds of the news instances on these two topics produced some kind of follow-up action. Conversely, business and sports news are two of the most deliberately sought out topics, but were not the topics most likely to inspire follow-up action. Some topics, though, show more alignment between seeking and acting. Entertainment news fell to the bottom for both, while science and political news remained in the middle for both. Just as speaking with someone offline is the most common action overall, it also rises to the top of actions taken for every topic, with community, crime, politics and health at the top of the list. 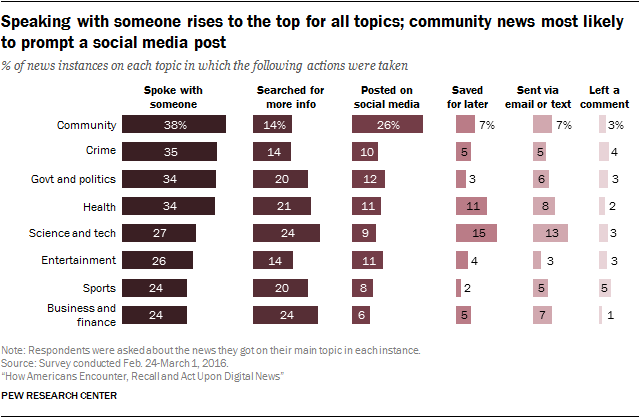 Community news also stands out again for its social nature, shared via social media at a far higher rate than any other topic (26% of news instances, compared with no more than 12% of other topics). Science news was bookmarked or saved for later (15% of instances) or sent to someone via email or text (13%) at a higher rate than most other topics.